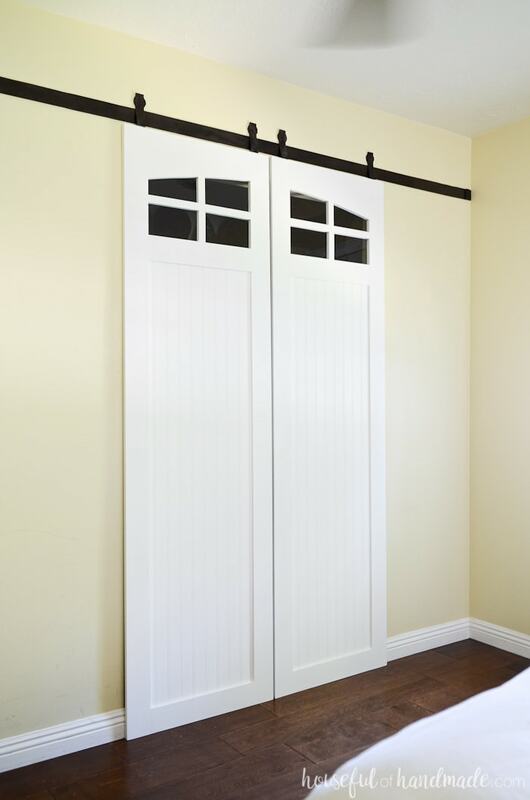 Sliding barn doors are the perfect way to update your bedroom. 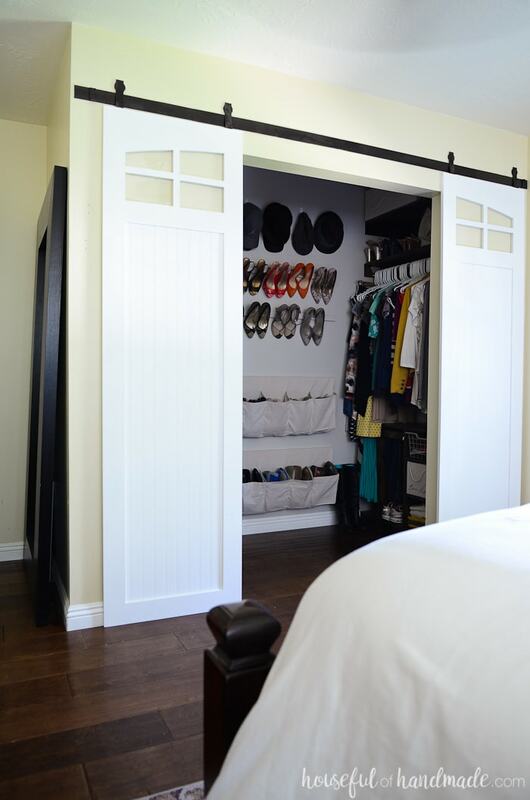 Replace bifold doors or mirrored closet doors with these beautiful closet barn doors. 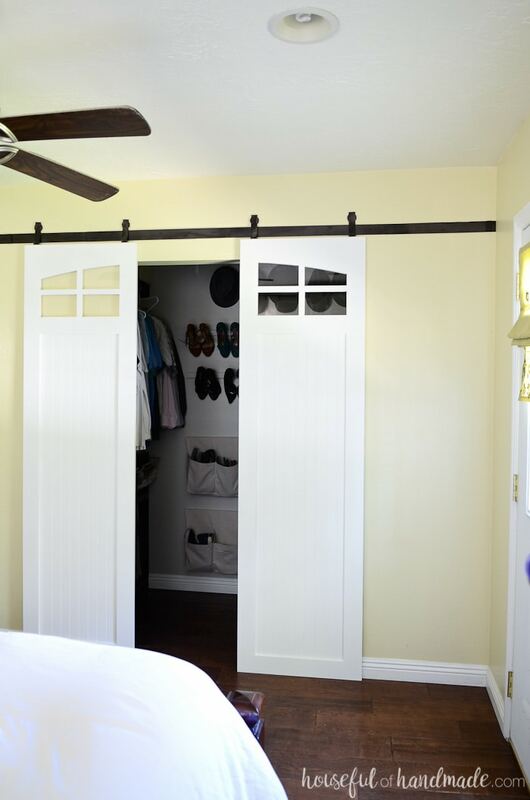 Closet sliding barn doors add instant charm to any home. They are a great solution for any room that’s tight on space. And the curved window detail of these barn doors add lots of farmhouse style, while still keeping the contents of the closet hidden. 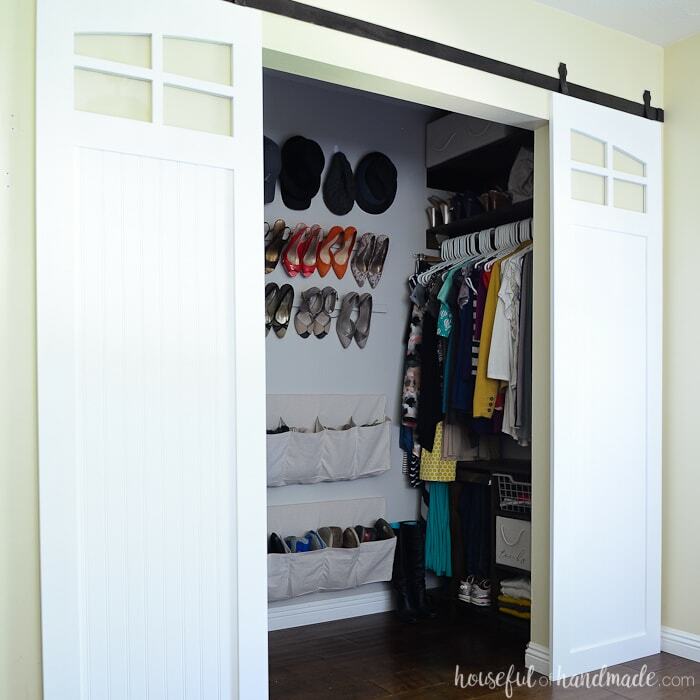 I partnered with Kreg Tools and their new project plan site, BuildSomething.com, to share the free build plans for these sliding closet doors with you. 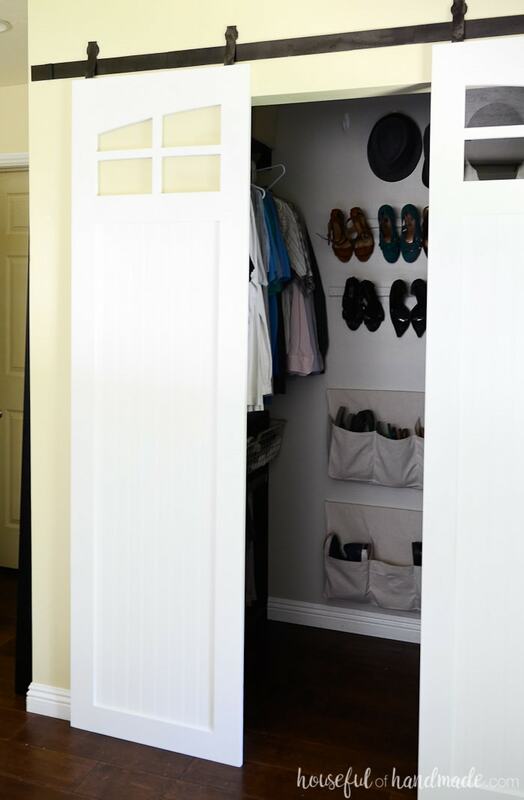 After finishing up last month’s $100 Room Challenge and making over our master bedroom closet, I almost didn’t want to add doors to our closet. I love how the $100 walk in closet remodel turned out. But I also really wanted to add some sliding barn doors to our house, and the closet was the perfect place to do it. When we built our closet area in order to add more space to our master bathroom, I never installed closet doors. I really didn’t want bifold doors in my master bedroom. Even pretty 6 panel bifold doors are still bifold doors. They tend to always be left open and then they encroach on the floor space (and annoy me that they are always open). And after living with bifold doors on our laundry room closet and closing those doors all the time, I knew I would fight them in the bedroom too. So for the last 8 years we have had no closet doors in our bedroom (maybe that is why I was so eager to give our crowded closet a makeover). But then I fell in love with sliding barn doors. 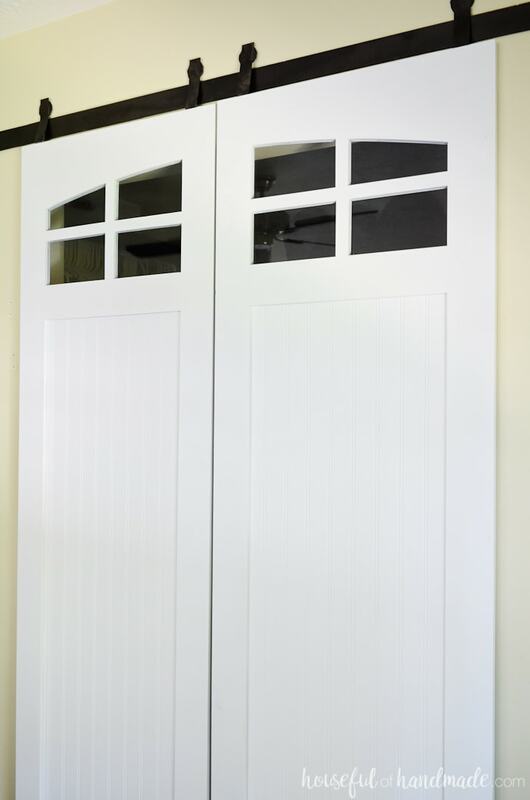 Most people use them to cover doors to their bathrooms or other areas where a hinged door would take up too much space. But they are also a perfect solution for closet doors. The sliding barn doors do not take up any floor space. Instead they slide along the wall. 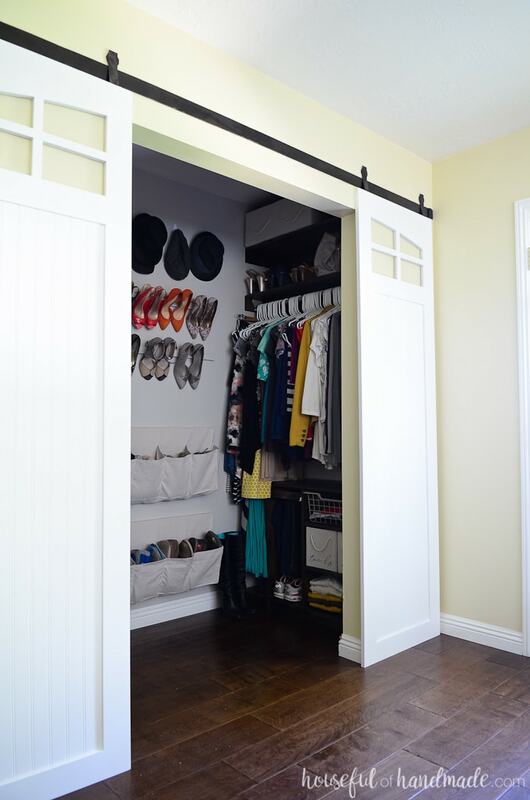 However, they also allow the closet to be completely opened up, as opposed to the mirror sliding doors that were put on every closet in the 80s and 90s. 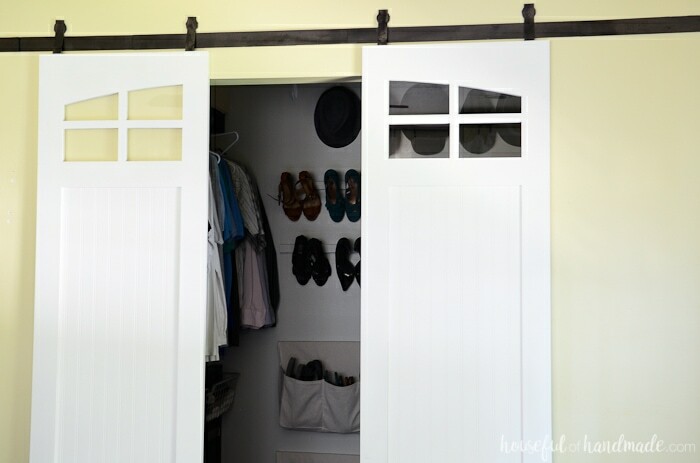 But my favorite part of using the closet sliding barn doors, when they are left open (which I am sure they will be), they are just as beautiful as when they are closed. They remind me of shutters, but for our closet. But of course I didn’t want just any old sliding barn doors for our closet. Nope, I wanted something with a little more charm and style. In order to really show off the new master closet, I thought it would be fun to add windows to the closet barn doors. The windows add just a little peak into the closet at the top, so they still keep all the closet clutter out of sight (even though our closet is beautiful, I still like to be able to close it off). And the curved windows give the room lots of farmhouse charm. 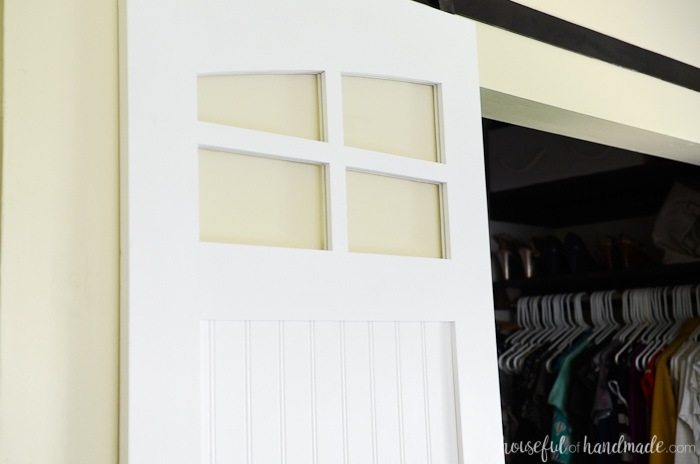 And can you believe that these closet doors were fairly easy to DIY? Thanks to the Kreg Jig and my new router, I was able to create beautiful farmhouse barn doors that look so expensive. But it only cost $120 to make both closet doors out of select pine wood. The process to make these doors is simple with a router. The grooves created by the router hold the door panel and glass nicely (and hide any bad edges). And the Kreg pocket holes help you build a super sturdy door. 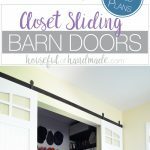 If you want to build your own closet sliding barn doors, visit BuildSomething.com for the complete build plans. And then come back because soon I will be sharing how to hang the new closet barn doors. Don’t forget to check out all these other fun woodworking projects and build plans. As designed, won.t the doors rub against the bottom wall molding? The barn door hardware actually holds the doors away from the walls a little bit (there has to be room for the rollers). This helps to keep the doors away from the baseboards. You did it again, Kati! Stunning!! These are the perfect addition to your closet! They look beautiful, both opened and closed. I’m getting ready to put barn doors in my dining room, so I’ll be back for your install post! Thanks so much Meredith. I absolutely love them. Good luck on your barn doors!